My husband and I ordered kits from 23 and Me to compare with what we learned via the DNA kits from Ancestry.com. There are some things that the 23 and Me data share that Ancestry.com data do not—fun things like the extent of your Neanderthal background, and interesting things like what seems to be a more precise breakdown of your ancestry composition. The picture above shows how my European DNA breaks down. It’s important to note that this is somewhat speculative. 23 and Me customers can change confidence levels to see a more conservative estimate. If I choose the most conservative setting, my results differ from those above quite a bit. I understand that some users find there is not much to see if they look at the conservative estimate, but mine seems pretty clear. I am very European, though what kind is harder to tell with a more conservative estimate. I assume that is because I’m an American, and I imagine I have a lot of European lineages in my tree. I am pretty certain about German, Irish, English, and French because of my genealogy research. The big surprise in the speculative view is a tiny percentage of Ashkenazi heritage. I can’t imagine where it came from, and I wonder how 23 and Me determined it was a possibility. Obviously, it’s not certain because it vanishes with a more conservative view. However, so does French and German, Southern European, and Scandinavian, and I know about the French and German in my background. Going back several hundred years, there is potential evidence of an Italian ancestor, but the stories about him are so wild, it’s hard to know what to think. I had long speculated he was Jewish and hiding that part of his identity. I actually thought he might be Sephardic. 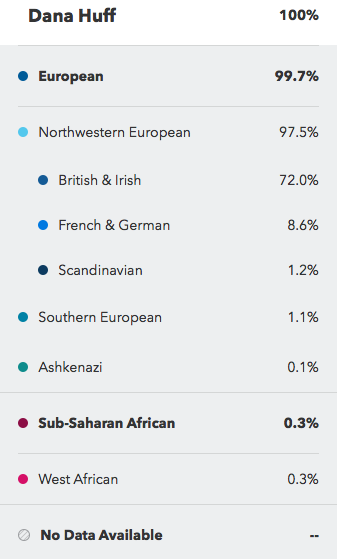 As far as I know, however, there are no Ashkenazi Jews in my tree, so that tiny percentage is a bit of a mystery to me. 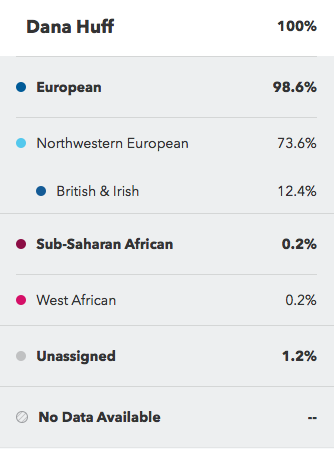 My Ancestry.com test indicated a small amount of African DNA, but it wasn’t very specific, and in any case, it indicated North Africa, not Western Africa or Sub-Saharan Africa. 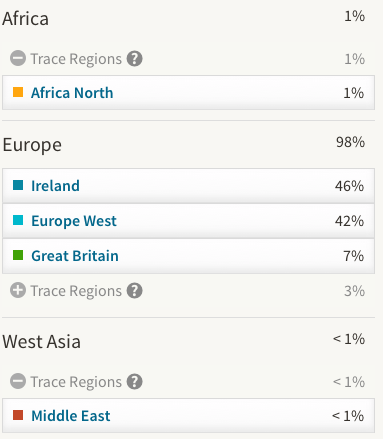 As you can see, even with the conservative ancestry composition estimate, my African DNA is higher than Ancestry.com estimated it was. I don’t deny the results, but I wonder why they are different. It’s the same DNA that was tested. I am also curious how Ancestry.com separates out Irish DNA when 23 and Me puts it together with English/British. 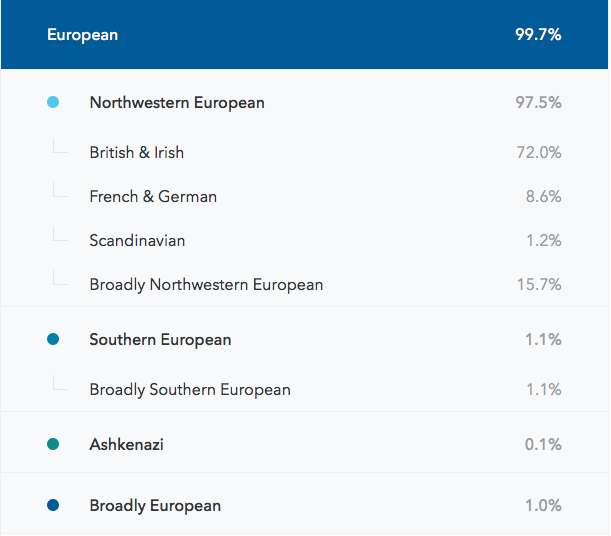 Both companies put my European heritage at about 98% or 99%, which does not surprise me. I’m curious as to how trace regions in the Middle East show up in the Ancestry.com test and not in 23 and Me. I wondered if that might be the Ashkenazi background because Ashkenazi Jews moved into Europe from the Middle East some time during Holy Roman Empire. I honestly don’t know enough about any of this to make even an educated guess. What does seem fairly certain is that I do have some African DNA, though whether it is North African, as Ancestry.com thinks, or West African and Sub-Saharan African as 23 and Me thinks, I don’t know how to determine. I actually am excited to learn this information, and as you can probably imagine, it raises a lot of questions for me about my family tree and especially about brick walls. 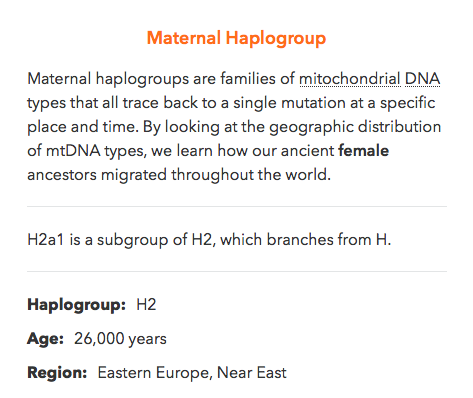 One thing I was really excited to learn from 23 and Me was my maternal haplogroup, or mitochondrial DNA (mtDNA) group. Of course, this got me curious because this particular haplogroup is more common in Eastern Europe and also is believed to have emerged from the Caucasus. If you are interested in that kind of thing, it’s the same maternal haplogroup as Dr. Mehmet Oz (Henry Louis Gates discusses Dr. Oz’s haplogroup in his book, Faces of America). Haplogroup H is quite common in Europe, so given my large percentage of European heritage, it’s not a surprise. I would love to be able to learn more about mtDNA haplogroups. I’m not really sure what this information really tells me at the moment, but it was, for some reason, information I really wanted to have. Because I am a woman, I have no paternal haplogroups to look at. I would be extremely curious to know that information, but the chances of getting my father to take a DNA test are probably in the negative numbers. My paternal grandfather passed away about fifteen years ago. It is possible male cousins descending from my father’s brothers would be interested enough to try, but I don’t feel close enough to that side of my family to ask something like that. It seems like a big request—excuse me, can I please have some of your DNA so I can find out about our fathers’ paternal haplogroup? For that matter, I’d be curious about my father’s maternal haplogroup, as I inherited mtDNA from my mother and not him, so it is probably different. My husband had a very good time with that result, which was much higher than his own. 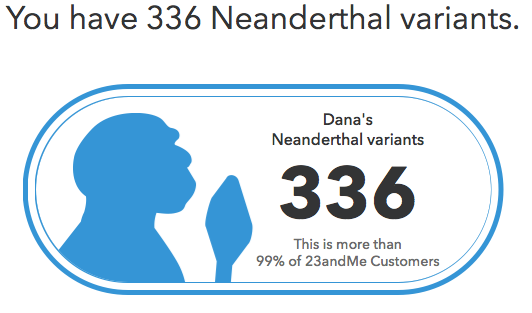 I don’t really know what this means, aside from the fact that 23 and Me says I inherited one Neanderthal variant that is associated with less back hair. So I have that going for me, which is good. With my husband’s permission, I will share his results here, as I know a lot of Huffs stop by looking for information about their families as well. One last fairly surprising result I wasn’t expecting—23 and Me allows you to compare your DNA to connections, and as it turns out, my husband and I are absolutely unrelated. We have 0 DNA segments in common. I kind of expected we shared maybe some small connection far, far in the distant past. It wouldn’t be that weird, given our families both lived in the South for generations, and it wouldn’t be inconceivable that we shared an ancestor. We might, but not within the last couple of hundred years, anyway. I used to joke with him that it was my mission to figure out how he and I were related, but it looks like I probably won’t figure that out.